"Grinchmas" returns to Universal Studios Hollywood and it's a real Wholiday Wholibration! The Who's Who of Hollywood, (including yours truly) came out Thursday night to Universal Studios Hollywood with one thing in mind ~ to celebrate Grinchmas of course! With First-Ever “Grinchmas” Mayoral Proclamation from the Mayor of Whoville Augustus MayWho, and the Mayor of Los Angeles, Eric Garcetti coming together to signal the start of the festive Wholiday season at Universal Studios. What Wholibration would be complete without the Grinch himself (and his dog Max) coming together with the whole town of Whoville to light up the giant topsy, turvy, swervy Grinchmas Tree. While festive music played, snow gently fell on us all, then we all counted down 5, 4, 3, 2, 1... The tree was lit as fireworks blazed the sky of Hollywood. It was a spectacular sight to see, one that definitely put me and my little Who in fine holiday spirits. 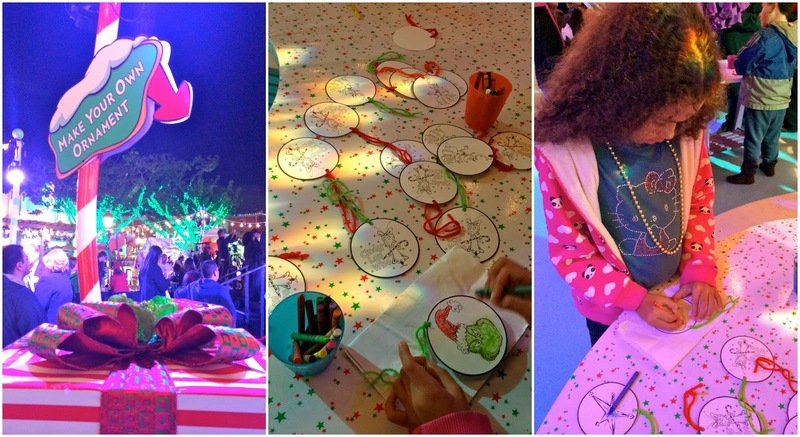 The night ended with all of the children, (including 200 very happy LAUSD students) making ornaments and hanging them on the trees in Whoville, and gingerbread cookie decorating ~ what a way to spend a school night! Shhhh, don't tell teacher! With the Holidays Wholidays upon us it's the perfect time of the year for spending a little extra time with your family, enjoying what this season is all about. Magic, hope, wonder, and love. There's real magic in the air at Universal Studios Hollywood all month long, while Cindy Lou-Who, and the rest of Whoville have taken over. Not even the Grinch can stop this party! * Don't miss Photo Ops with the Grinch and his dog Max. * Cookie and Ornament Decorating in Universal Square. * Standing Beneath the 60-foot Grichmas Tree. * Story Time with Cindy Lou-Who. * The Whobilation show at the original Whoville movie sets aboard the world famous Studio Tour. “Grinchmas” will resonate throughout the theme park and runs weekends on December 6-7 and 13-14, then continues daily from December 19, 2014 through January 3, 2015. “Grinchmas” is included in the price of theme park admission. More information available at www.UniversalStudiosHollywood.com. Celebrate the Festive Wholiday Season with your Loved Ones! Merry Grinchmas and a Happy Who-Year! Disclosure: I was not compensated for this post. I was invited as a member of the media to this event, which inspired this article. The opinions shared on this blog are 100% mine and 100% fresh.